We are especially pleased to announce that our own Penny Delray has been promoted to Studio Leader for BDS! Penny has been designing with us for four years. Before joining Barrett Design Studio, Ms. Tant was a senior interior designer for two of Jackson’s major architectural firms. She was also an assistant vice president/facilities designer, for AmSouth Bank. She is N.C.I.D.Q certified (National Council on Interior Design Qualification). She is a professional member of the International Interior Design Association (I.I.D.A.). In her new role as Studio Leader, Penny will be responsible for coordinating and leading our team of designers, allowing Barrett Design Studio to take on more ambitious projects, bringing “New York Style . . . Mississippi Grace” with us wherever we go! I am very happy to have Penny as my facilitator and right hand woman. This is Peggy’s Cove in Halifax. After our great tour of the carpet factory, we had a day of pure joy. I took this with my IPhone. There was no direction that was not the perfectly charming scene. We viewed the ocean, shopped the quaint shops, ate lots of lobster and Halibut. It was just a truly inspiring trip for all of us. –YES – GO!! The lighting was soft edged sunlight. These anchors look like they were ordered from Central Casting. A few of us in the office, myself and 3 of my designers, were treated to a tour of the Tandus-Centiva carpet factory in Halifax, Canada. We learned quite a bit! Please note the huge steel toed shoes we had to wear! I’ll also show a few of the incredible photos of the sites. Thank you, Jason, James and Christopher, our hosts. Dorothy, one of our designers on our team, and I just returned from BDNY, the Hospitality Trade Show in New York. We saw lots of great new products! The lighting fixtures at the show were fabulous! Unbelievably beautiful pieces. These are a few of the new trends in lighting fixtures. Arturo Alvarez – The photo does not do these justice. Available in any size, these shown were about 30 inches wide each. Kuzco Lighting – also – simple and elegant…. 2nd Avenue -a HUGE OVERSIZED chandelier – close to 6 feet long. Kuzco Lighting – the look of rock crystal was everywhere. I loved it. Corbett Lighting There were many sizes available in this gold mesh fixture. We saw many more wonderful pieces. Several great ones in Elegant Lighting also. I’LL POST A FEW MORE TRENDS AND ITEMS SOON. Life at BDS keeps getting better and better; we are pleased to announce that Allyn Inzinna is our newest interior designer! Allyn was previously a designer with Ethan Allen. She graduated in 2013 from Mississippi College with a degree in Interior Design. Allyn comes from a long line of interior designers and grew up around interior design. Her mother is an interior designer who has experience in both commercial and residential design. Allyn has also interned with Dean and Dean Architects in 2013 as an interior design intern. We had a fabulous time in Vegas at the Hospitality Design Expo. 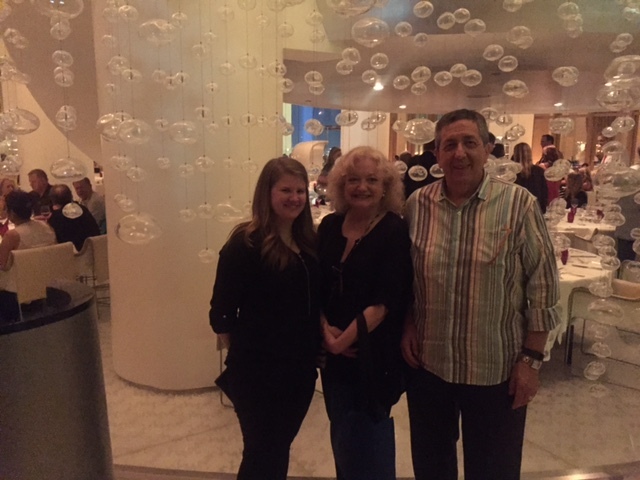 We had the honor of dining at The Mix, the beautifully designed restaurant in The Delano Hotel. Celebrity chef, Alain Ducasse, was sooo fabulous! We were the guests of our favorite lighting consultant, Jonathan Larkin, of Hospitality Lighting Management. Thank you for a special night! Fabulous meal at The Mix! Kacey, one of our staff designers, myself and Jonathan.